Cinder, an administrator on the Midway Boards, has released another screenshot from Mortal Kombat: Armageddon. This time the image is of the massive Character Select Screen. 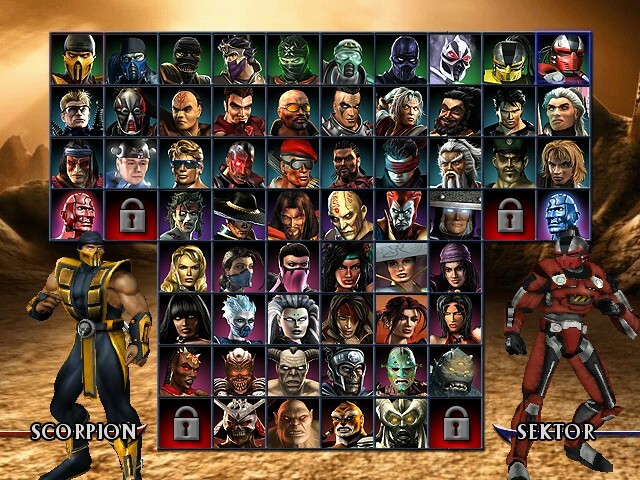 The screen features the entire massive roster of characters slated for this ultimate version of Mortal Kombat on current generation consoles. Some items of note, Chameleon is featured in the middle on the top row of characters, while the middle-bottom far left and right corners are your "Create a Fighter" characters. Hidden behind the four question marks are assumed to be Meat, Blaze, and Konquest adversaries Taven and Daegon. You are incorrect. It is "Chameleon" who is featured in the middle of the first row. "Khameleon" is conspicuous only by her absence. No problem Jeff. After weeding through 27 pages worth of comments on the Midway forums hoping for some new info (didn't find any btw) the name kinda got drilled into my psyche. it's looks like we're going have to unlock just four characters. i cant wait to see what chemeleon looks like, and what his moves are! I love how the rows have some sort of theme to them. Top row is all ninjas, there are to rows devoted to the females, all the bosses are together, fourth row feature key characters from MK 1 and beyond, etc. And btw, who are the two characters at the far-left and far-right of the fourth row (from the top)? they are the icon for loading your created character, player 1 on the left, player 2 on the right. I love how the rows have some sort of theme to them. Top row is all ninjas, there are to rows devoted to the females, all the bosses are together, fourth row feature key characters from MK 1 and beyond, etc. I like how they've done that as well, man. It's not so random as in other MK games. Maybe Sektor needs a good coat of polish, Sapphire?